Discover stories behind the ink. Hidden within an apartment complex in Jakarta, with no sign boards or hints of what lies within, is Mulie Addlecoat’s tattoo studio. It was almost a recreation of the forbidden atmosphere of the tattoo scene in New York City in the 60’s when the art form was banned. Step through those doors and you would find yourself in an inspired space with white brick walls, sketches and art and even self-designed equipment. But be warned, if you do not know why you want to get a tattoo, you just might be sent away. Mulie Addlecoat started his career in 2011 with about four clients a month and today his schedule is fully-booked a year ahead. 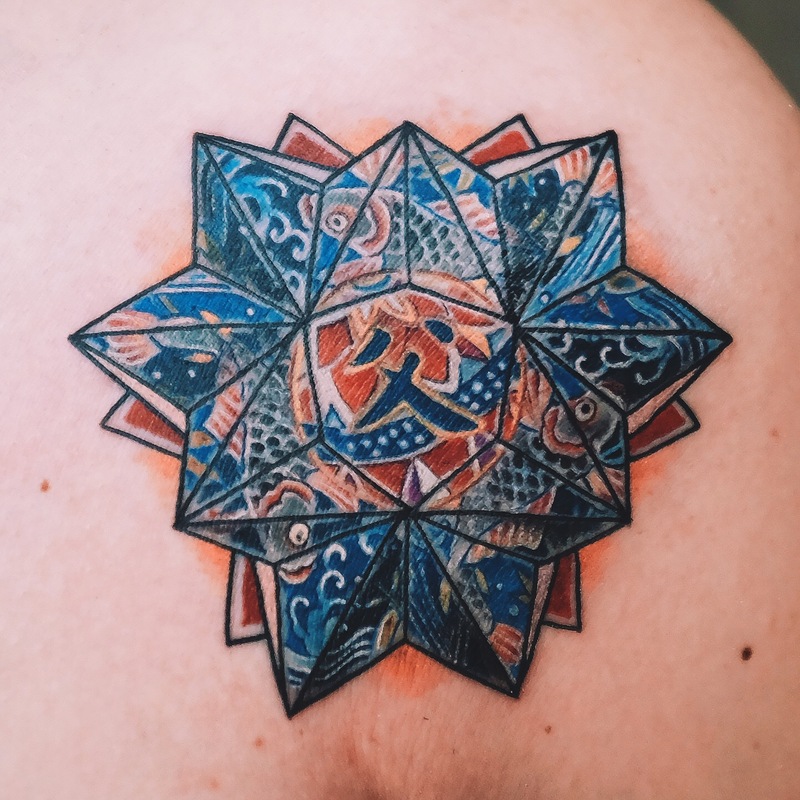 Beyond his unique oriental style that combines elements of origami, what sets him apart are his deep dives into the meaning behind each tattoo he creates. 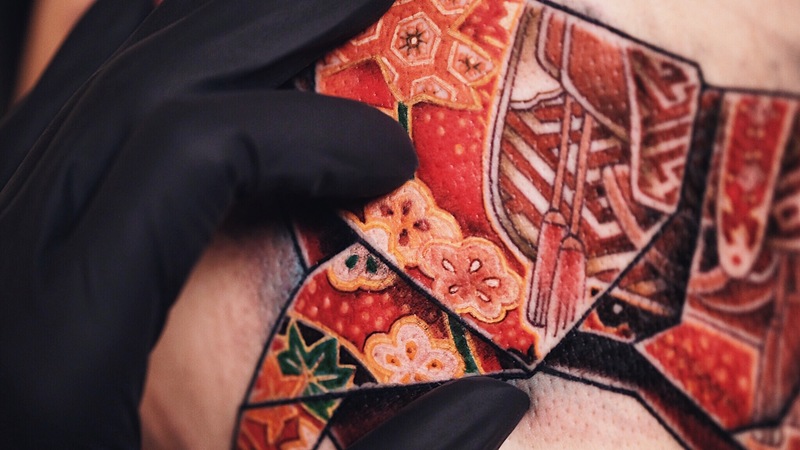 At the end of the day, Mulie transforms clients’ struggles and stories into meaningful permanent symbols. I never attempted to pursue a career as a tattoo artist. I mean, I love tattoos and getting them, but I detest the “artist” because most of them that I’ve encountered were snobs and had selfish rockstar-syndrome. I got into this career because I got into an “accident”, it started back in 2009, when I went to the 2nd Singapore Tattoo Show. 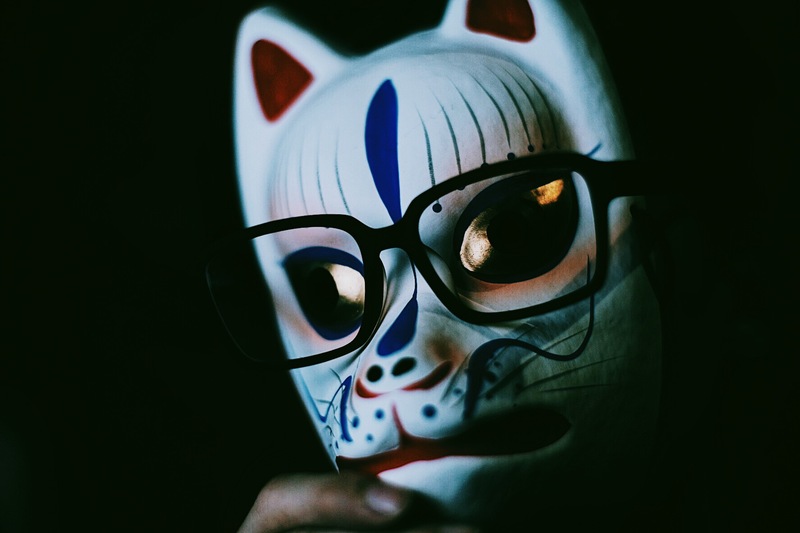 With a friendly smile, he was scratching his head and goes “Uhhh…” I was thinking to myself “Oh my god, how am I going to brief him?” but luckily his apprentice translated our conversation and I managed to ask for a Japanese octopus tattoo at my elbow. During the first hour, the apprentice asked me, “My master would like to know, are you a tattoo artist?” I said to him, “No, I’m a different kind of artist.” The time past and after four hours under the needle, it was near completion. However, before we can finish colouring the eye and couple of tentacles, he politely told me that the convention is about to close and we can finish it at the hotel or the day after at 12pm in the convention. I said, “I’m already tapped out, can we finish tomorrow?” and I remember hearing the crowds sigh in disappointment in the back. Returning to the convention the day after, I discovered that his booth was empty, and at 3pm I started to panic as his booth remained empty throughout the day. Upon my frustration, I saw someone who was Diau An’s spectator and asked him if he knows where Diau An is. He told me that Diau An had a problem and had to return to his country. I was speechless. From there, I had two option, either I wait and search for him hopelessly or finish it on my own. At that time I was thinking “How hard can it be? It’s just colouring red tentacles.” I figured since I couldn’t contact him in Taiwan or speak Taiwanese, I might as well go with plan B and bought some tattoo equipment. I had never been so wrong, it was really hard to even attempt tattooing on a practice skin. All my lines wriggled like curly ramen. So when I returned to Indonesia, I tried looking for an apprenticeship. I thought my luck had reached a dead end after months with no results. And out of the blue, my friend called me and said, “Are you interested in learning how to tattoo? I just got an offer.” I told him that I was very interested and that’s how it started. At that time my main purpose was to simply finish my own octopus tattoo. But that purpose quickly changed. After five months of apprenticeship, when I finally figured out how the tattoo machine works, something just “clicked” in me. It felt so natural to me how tattooing works and I loved the process. I started figuring out myself how to do other techniques and I could see so much possibilities. I was hooked. Fast forward a year later, I found out that my wife’s friend speaks Taiwanese, so we got her to write an email, and Diau An finally replied that he was about to attend the 2010 Singapore Art & culture tattoo convention. So I booked a ticket and made my appointment. I flew to Singapore and finally had my octopus tattoo done with some additional background. 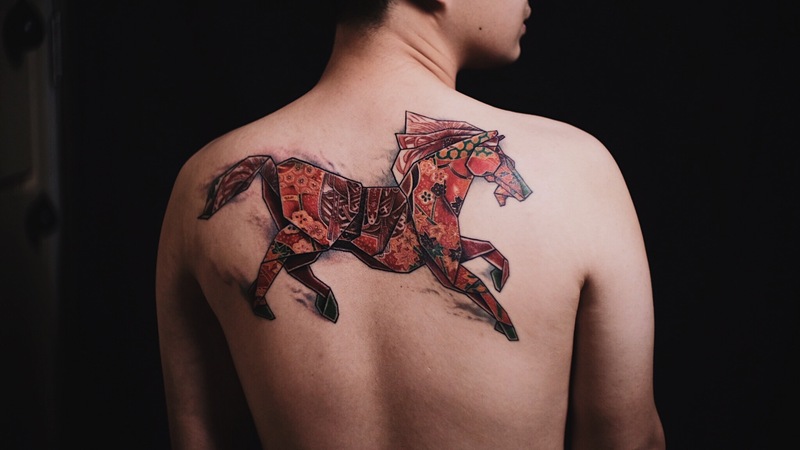 After completion, he politely asked me the same question again, “Are you a tattoo artist?.” At that moment, I realised that I was going to be a tattoo artist and his humbleness showed me what kind of tattoo artist I should become. It was excruciatingly nerve-wracking because your canvas is a living breathing person that can move at anytime. At some point, I was almost breaking down. But my mentor told me not to, and that it’s okay to make small mistakes. Still, my hands were shaking in cold sweat. At the beginning I was just curious about who my client is, what they do for a living and I wanted to know where are they going to take my artworks to. I’m very possessive with my artwork so I genuinely ask a lot of questions, like why do they want to get the tattoo and what does it mean for them. Yes my process is very much like a dance, a duet. I cannot dance alone and produce impactful tattoos. Dancing alone will take me no further, the approach has to be a collaboration of mutual understanding and synchronicity. I will share you 3 stories among others that really have had a profound impact in me and my clients. He requested his 2nd tattoo when we were in the middle of a back-piece project. He told me he wanted an origami with the kanji “father” written on it - he wanted to promise his sons that he would be a role model father. Little did he know, that idea was actually hard for me to process. I know him as a workaholic and he once told me that after long hours of working he would return to his private apartment instead of going home to his family. 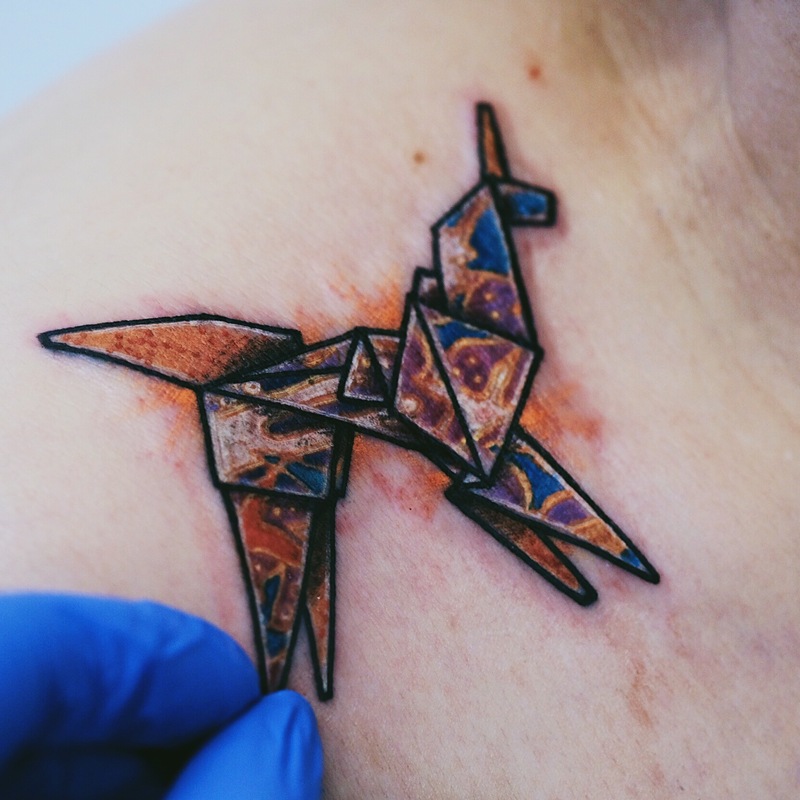 He makes a lot of sacrifices with his time, and it made me struggle when designing and tattooing it. In my head, I kept questioning myself, “Does he deserves the title of father?” I did it still and ended up hating the tattoo and felt ashamed of it. Years later, I got news from him that his father was diagnosed with cancer and we had to postpone the back-piece project. He told me that he had to take his father to the Netherlands to treat the cancer. We talked a lot over text messages ever since and upon his return, he told me that he was devastated with the failed Chemo process. After the gruesome experiences, he vowed never to set foot again in that country. He wanted to slow down in life and spend more time with his sons and wife. At that moment I felt proud, that the “father” idea has finally manifest in him. He had become the father figure he always wanted to be and I ended up loving that tattoo. My friend, Yola, was separated with her twin since birth, just as a fortune teller suggested to their parents that it would be unlucky for the twins to grow up together and their parents actually took up the stupid suggestion. Fortunately, Yola eventually reunited with her twin named Ochie when she was a young adult. They shared personal stories and reconnected for the lost time. And that reconnection was immortalised in the form of a matching tattoo. It was a beautiful reunion, and I got to be a part of that moment. It felt very fulfilling. She was in her 40’s and worked in a book publishing company where she loved to translate sci-fi and fantasy books. She told me that she had been fighting with depression in her life. Everything felt out of control. Despite being the youngest in her family, she had to take care of her parents and brother, because her older brother was a mess. She felt she had no choice in life and went through a lot of psychiatric sessions. Her psychiatrist eventually told her that she couldn’t rely on the sessions forever and that she needed to get better and find an activity or therapeutic hobby that could soothe her. 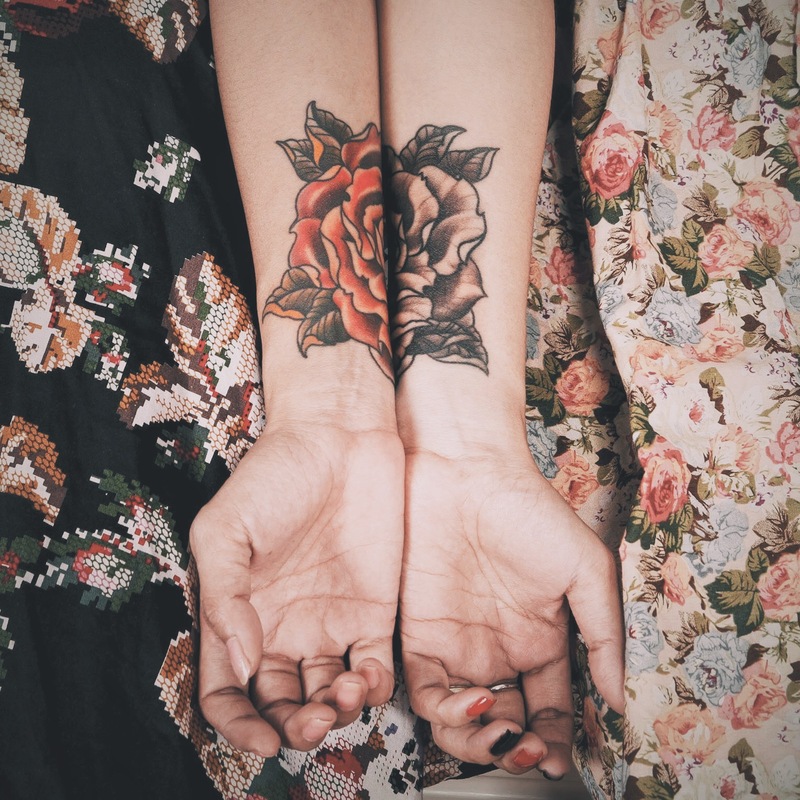 She chose tattoo and said that it feels therapeutic after getting a tattoo. It’s what I’d call the ‘Universal Appeal Style’. I’ve developed it later in the aftermath of my personal apocalypse. Remember the 2012 prediction that the world would end? It was stupid right? But it actually did happen to my world. Several years after my mother’s death, my family was under quite a bit of stress. At 2011, my father became schizophrenic and had a stroke, right after the birth of my daughter. At that time on his dying bed, with half of his body paralysed, he told me that he couldn’t stand life anymore and wanted to die. He passed away in 2012. His words still resonate with me until today, because at the same time, my agency almost went into bankruptcy. I had to let go of my employees, and I was left with $400 in my bank account to support my family. At that time, I only had an average of 4 tattoo clients a month. Nothing worked out and everything was failing. Several months after my father’s death, while I was still coping with the grief, my sister-in-law got spine cancer. I went to the hospital to cheer her up and instead, she said, “I can’t stand it anymore, I want to die.” She passed away shortly afterwards. The grief didn’t just end there. The next year, my grandmother-in-law passed away. And at my lowest point, my dog, which was also my best friend, died too. I was ready to quit life too. Fortunately my family kept me hanging on. I didn’t leave my room for a long time. I shut myself in and cried a lot. I was so traumatised with the series of events and was burdened with the awareness that anyone could die at anytime. Every night for two years, I would put my head on my daughter and wife’s chest to check if their heart was still beating and breathing. In desperation, I would bury myself in books, research and crazy theories to counter my idea of suicide. And why does this traumatic event have to do with developing my style? It was during this period on one of my sleepless nights, I happened to watch a documentary about Stan Lee. He was struggling with his early cowboy comics and nothing seemed to work. Everything was failing for him too. As he was about to quit his job at Marvel, his wife told him to create a comic that at least he would love before quitting. It was this that led him to create a series of superhero comics that would change pop culture history forever. Yes, I’ve let go of 2 apprentices because their main focus was instant - instant process, instant results and instant fame. I couldn’t accept that attitude. They had a lot of excuses, even before starting the lessons. When I began learning to tattoo, I had a 9 to 10 job, I had an agency to manage and a baby daughter to take care of. I would start learning tattoo from 1 am until 4 am while changing the diaper at 2 am. I had no complains, because I loved it and it didn’t bother me. When you love something so much, it feels like a calling and you’ll do it with all your soul. I really don’t know, and that’s what I’m looking forward for.